The Foo Fighters are one of the last true rock bands left standing. Dave Grohl’s bunch has been around for over 20 years now and are still cranking out great rock albums. They are also still one of the top live acts to see as well. That was evident Sunday night at Wrigley Field in Chicago, as the Foo Fighters put on a 160-minute show that rivals any show I’ve ever seen as one of the best. Like most Foo Fighter shows, there were a couple surprises. Grohl jumped behind the drums for the Queen song “Under Pressure,” as band member Taylor Hawkins performed with Luke Spiller of The Struts. Speaking of The Struts, The band did quite an admirable job opening for the Foos. Spiller is quickly becoming one of the must-see frontmen on rock music. While Grohl loves to talk to his fans, the band couldn’t spend a ton of time chatting and telling stories, as they had to power through a 24-song set that had a little something off every Foo Fighters album released to date. Grohl did start the show by acknowledging that he was ready to dance and party all night. Let time the former Nirvana drummer played Wrigley, he was confined to a throne after suffering a broken leg. If Sunday’s show is any indication, St. Louis is in for quite a treat come October 13 when the band stops at the Enterprise Center. There are still some tickets available for the show. I know I will be there for sure! 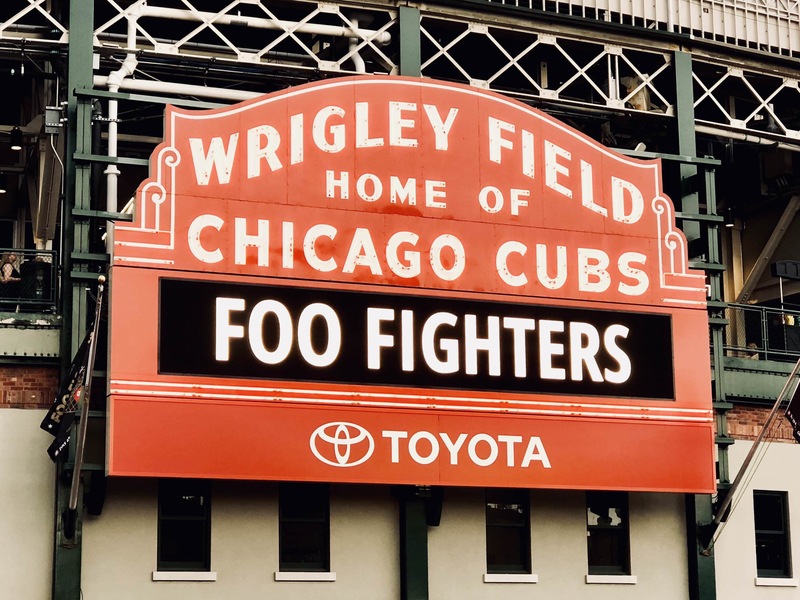 Foo Fighters show at Wrigley Field gets an A.